Did you ever notice how the graduates of our elite universities and law schools have terrible memories? The latest case of elite memory loss is the corrupt former director of the FBI, James Comey. Comey was subpoenaed by the House Judiciary and Oversight committee and after a judge laughed at his attempt to fight the subpoena on the grounds that the testimony would be closed, and he wanted it open, Comey agreed to appear, and the House Committees chose to release the transcript of his testimony. It was almost not worth the trouble, but you can read it through this link. After reading the transcript one thing is very clear; someone that can’t recall very basic events in such a high profile position is either a liar or incredibly incompetent. ...can argue that I was misleading when I said in my tweet that he was basically saying he didn't read the application - but other than stating that he read it, he shows no sign of actually having done so in his answers to questioning. Why would that be? ....campaign. Comey remembers big deals. The inclusion of the Steele dossier in the Carter Page FISA application was an international news story - not some regular old signing of some paperwork crossing his desk years ago. It's been debated, examined, and published (redacted). 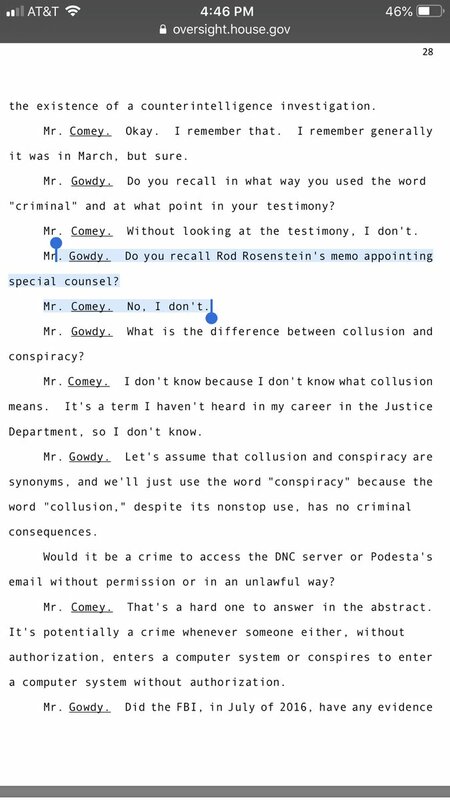 With that as his backdrop, Comey told the committee he couldn't recall the actual elements of probable cause argued in the application (the Steele dossier part is public, and unreacted) and....he couldn't recall whether or not the Steele dossier was used in the application. ...it's the least worst of the two. So Option Two it is - Yep, I read it. Nope, don't remember anything about it. Yep, I believe Carter Page was an agent of a foreign power we should be allowed to legally spy on. Nope, don't know why we believed that. Man of integrity. The Weingarten and Beale tweet strings remind us of the problems Hillary Clinton had in remembering details in the Benghazi and email server investigations. As the Washington Post’s Aaron Blake reported on September 2, 2016, in the three hours-plus that Hillary Clinton spoke with FBI investigators about her private email server on July 2, she cited more than three-dozen things that she could not recall. Among them were things such as specific emails that perhaps nobody could be expected to remember years later, but Clinton also said she had no recollection of several key moments when it came to her email server, including briefings on how to handle classified information and key conversations about her server. It seems that James Comey (William & Mary undergrad and University of Chicago law school) and Hillary Clinton (Wellesley College and Yale law school) are infected with the same memory loss virus that affects so many of the elite university graduates who make up DC’s political class, leading one to conclude it is not memories, but ethics and integrity that they are missing.